If you’re just joining my story, here’s a quick catch-up. Once upon a time, I was an evangelical Christian. Although I was not a die-hard creationist, I considered creationists to be “my team” and evolutionists to be the godless “other team.” I trusted creationists because they were fellow Christians, and conservative ones at that. A decision my wife and I had to make forced me to investigate the creation/evolution issue more closely. I hope the last few posts have given you a window into why I was appalled at how dishonest the creationist arguments turned out to have been. Now I’d like to give just a glimpse into the sort of arguments that I discovered on the side of evolution. Most remarkable was the way completely independent lines of evidence all pointed to the same conclusion. This graph is an example. It’s from the book that opened my eyes to the power of the evolutionary explanation for life, Scientists Confront Creationism. I’ll walk you through it, and then I’ll say why I found it so compelling. The horizontal axis extends backward in time. You’ll recognize the familiar geologic periods (or at least the Jurassic, if you’ve seen Jurassic Park). Radiometric dating has enabled us to estimate how far in the past each period occurred. Based on the fossil record, scientists have determined when the common ancestor of certain pairs of organisms lived. For example, plants and animals last had a common ancestor about 1,200 million years ago. Vertebrates’ and insects’ last common ancestor lived near the dawn of the Cambrian, about 600 million years ago. Now is where it gets really interesting. The vertical axis represents the amount of change in certain proteins, as measured in amino acid changes per 100 sites on the protein molecule. Of the four proteins represented, hemoglobin is probably the most familiar, so let’s look at that one. Amino-acid changes to the hemoglobin molecule over time are shown in line second from the left. Straddling this line just below the label “Carp vs Lamprey” you see bounded bar. It indicates that if you compare the hemoglobin molecules of carp with those of lampreys, you’ll find about 90 changes per 100 sites. The bar is placed at about 500 million years ago because that’s where the fossil record shows the carp and lamprey diverged, at which point their respective hemoglobins could mutate independently. The graph shows similar comparisons for several other divergences, and three other proteins. Now here’s what’s remarkable about it. First, notice how beautifully the bars fit on the lines. If the radioactive decay that has been used to date the geologic ages has been constant over time (and there is no reason to believe otherwise *), this would mean that the rates of protein mutation have also been constant. This validates evolutionists’ claim that the amount of change in a molecule is a reliable molecular clock: mutations occur randomly at a constant rate, so the accumulated mutations indicate how long mutations have been occurring. But wait! There’s more!! You no doubt noticed that the slopes of the four lines differ: histone IV has changed hardly at all, while the others have changed more rapidly. Why is this? It turns out that these molecules have evolved at a rate proportional to the degrees of freedom they have in fulfilling their function. As Scientists Confront Creationism explains, “…histones are a class of proteins that are bound to the DNA in cells that possess a nucleus. … Any change in histones could therefore have a destructive effect on the integrity of cells. Thus, the histones of organisms as diverse as peas and cows are almost identical.” Hemoglobin, by contrast, only carries oxygen from lungs to cells and ferries carbon dioxide on the return trip. Those are important functions, to be sure, but there are many ways to solve those problems without jeopardizing the integrity of the cells. Therefore, the evolution of hemoglobin has been less constrained and it has obliged by evolving more rapidly. This is all from just one graph in one chapter of Scientists Confront Creationism. The book is filled with this sort of interlocking evidence from many more independent disciplines. 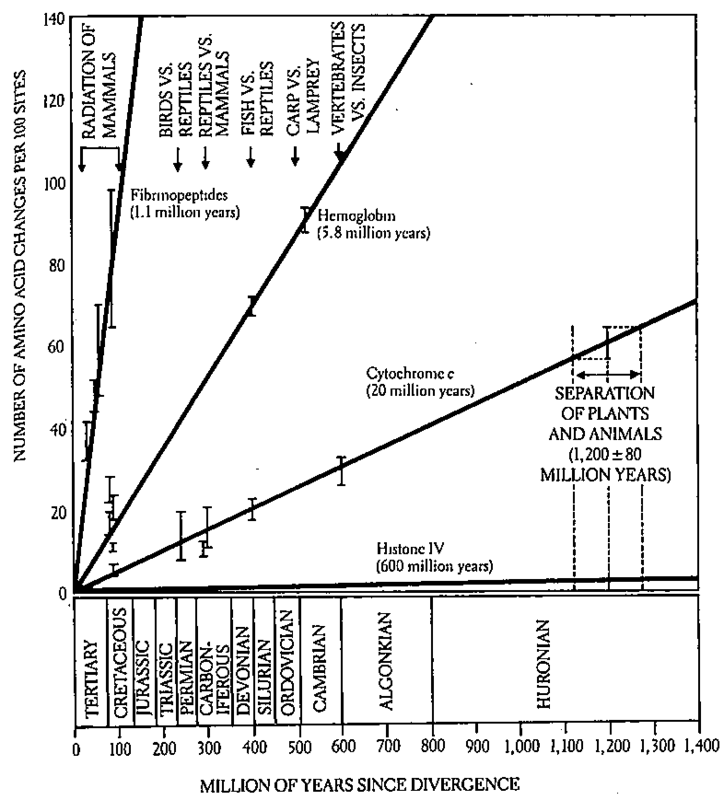 Could a Designer have created carps, lampreys, mammals, birds, reptiles, fish, insects and plants with just the sort of genetic divergence shown on the graph, and apparent common ancestors at just those apparent times — when in fact the organisms are not related by common descent, and their apparent age as measured by radioactive decay of the rock layers in which they are found is just a fiction? Of course he could have. He could also have created the universe 10 minutes ago, including your false memory of what you had for dinner last night. For that matter, why not believe this is all a dream, and you’re the only being that exists? You may not take the last suggestion seriously, but it’s hard to disprove; a 10-minute-old universe may seem only slightly less plausible, but is equally frustrating to argue against; a Designer that creates things to appear as they are not is actually quite plausible to some people but distasteful to most; and most scientists seek completely secular explanations, but that is not in the cards for religious people. So why choose one outlook over the others? Are all of these positions just a matter of faith? That will be the subject of the next post. * — Creationists dispute the constancy of radioactive decay, because they must. The Institute for Creation Research and the creationist organization Answers in Genesis collaborated on a study called Radioisotopes and the Age of the Earth, or RATE that claimed “There is evidence that nuclear decay rates were grossly accelerated during a recent catastrophic episode or episodes” (i.e., Noah’s Flood). The equally Christian, but non-creationist, American Scientific Affiliation counters that the heat produced by this alleged million-fold increase in radiation would have vaporized the Earth, and even if the Earth survived, Noah and his passengers would have been killed by the radiation itself. They quote the RATE group as acknowledging these problems, but being “confident that these issues will be solved.” I suppose you can solve any problem with a miracle, right? This entry was posted in Christianity, Religion, Science, Truth and tagged Apologetics, Apostasy, Creationism, Evolution, Science. Bookmark the permalink. Very interesting research. Would like to know if you currently believe in the God of the bible and if not in what do you believe. Have a look at the following link about “Evolution vs. Design” 3 parts and let me know what you have to say about it. Marino, I believed in the God of the Bible for about 40 years, but had to shed that belief a few years ago. I wrote a series of posts about that starting here: Why I Left Evangelical Christianity, Part 1: The Wake-Up Call. Currently, I consider myself a freethinker. See the page on this blog called Most Important Posts for more. I did visit the link you gave. There’s a lot there. To answer your question, “let me know what you have to say about it,” I would have to write a book. Is there one topic in particular you’d like me to address? Yes indeed the above mentioned “Evolution Vs. Design” Part 1-3. So as a freethinker what is it you actually believe in and if you as you said shed that belief not too long ago why is it that you are still pretty much interested in writing and researching about biblical matters at all?? You could have easily walked away from your former belief and moved on doing or writing about some other subjects. Also have you ever considered that the scriptures have been corrupted with bias translations etc. with the ages and that this could have been a trigger point for you to shed your belief? Would like to hear about it from you..
>> Yes indeed the above mentioned “Evolution Vs. Design” Part 1-3. If this is your response to my request for a narrower question, then I must ask you to narrow it again. Is there one particular argument for design that you think is a killer? One weakness in evolution that you think has not been adequately addressed for you? >> So as a freethinker what is it you actually believe in…? My conviction is more about the method for finding the truth than the result. See Hierarchy of Methods. >> Why is it that you are still pretty much interested in writing and researching about biblical matters at all? See Why Do Atheists Care About Religion?. >> Also have you ever considered that the scriptures have been corrupted with biased translations etc. with the ages and that this could have been a trigger point for you to shed your belief? The reasons I shed my belief did not hinge on small matters of translation. Did you read my series on why I left evangelical Christianity?